The Rubik’s Cube was invented in 1974 by a Hungarian professor of architecture, Erno Rubik. He was toying around one day and attached several blocks together with a rubber band. In this original system, after several twists, the rubber band broke. He then became interested in the structural problem of how to move the blocks independently for an arbitrary number of turns without the cube falling apart. He was eventually successful at solving the structural problem and, shortly after its invention in 1975, he applied for and was granted Hungarian patent HU170062, where his “magic cube” was first marketed. The puzzle was licensed by Rubik to be sold by Ideal Toy Corp, in 1980. Because Rubik had not met the requirements to be able to file an international patent in the time span required, it allowed anyone to manufacture and sell one of these “magic cubes” outside of Hungary. To help get around this problem somewhat, Ideal Toy Corp changed the name to the more memorable and trademarkable “Rubik’s Cube”, rather than sticking with the generic “Magic Cube” name. Rubik was eventually granted patents for the Rubik’s Cube in a variety of countries, such as the United States in 1983. Bonus Fact: The Rubik’s cube was also independently invented by a self-taught engineer, Terutoshi Ishigi, in Japan in 1976. His cube was almost exactly like Rubik’s cube inside and out, though he knew nothing of that, having invented his cube around the same time as Rubik. 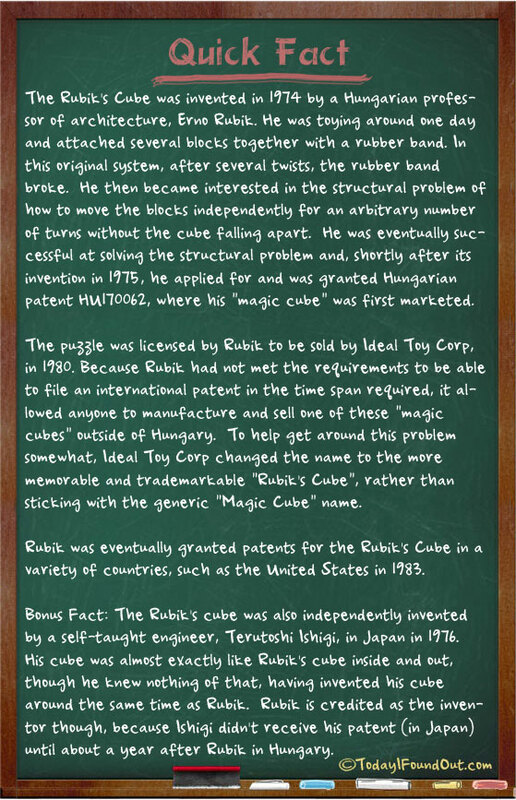 Rubik is credited as the inventor though, because Ishigi didn’t receive his patent (in Japan) until about a year after Rubik in Hungary. I guess I’ve been too used to reading newspaper headlines recently, because a title like ‘The Rubik’s Cube Was Invented by Rubik’ seemed pretty… self-explanatory.